Here in Southern California, avocados are plentiful all year long (and they're usually available at a great price.) Our kids are raised eating this creamy soft-textured green fruit, and we put it in our salads regularly without much thought. Green guacamole might be a frightening sight to children who aren't familiar with it, but our So-Cal kids happily gobble up scoop after scoop with tortilla chips. We sure love our guacamole. 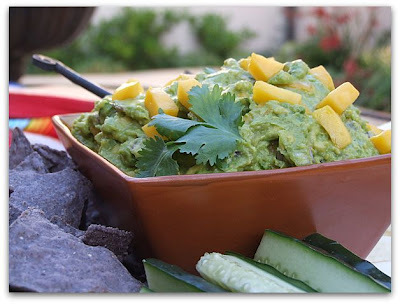 Rick Bayless' version adds a bit of juicy, ripe mango to create a Mango Guacamole. 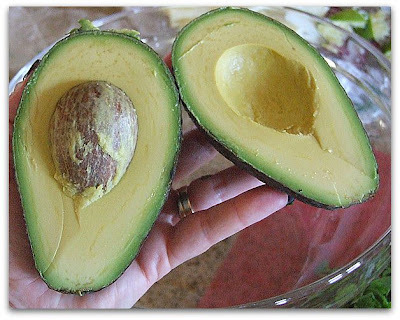 A ripe avocado should give just slightly when you gently squeeze it. 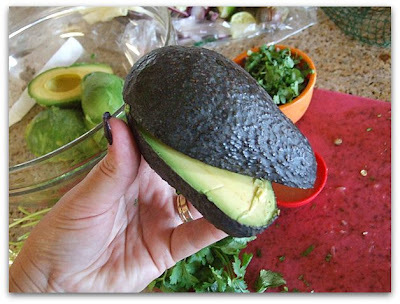 If it's hard, the avocado will need a couple of days on your counter to ripen. Open it up by slicing a knife all the way around and down to the pit. Twist halves in opposite directions to open it up. To remove the pit, gently tap a sharp knife onto the pit. Twist it and it should pop out easily. 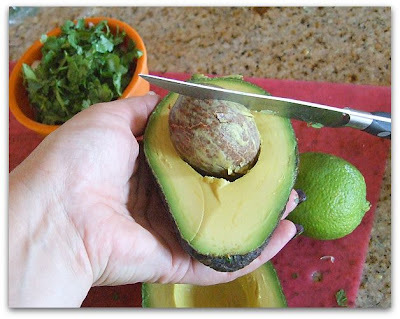 Scoop out the flesh with a large spoon and the avocado is ready to use. Mango Guacamole was the second appetizer that I made for our Yucatan-themed Gourmet Club's dinner party. (The first one was that Ceviche that I blogged about last post.) If I have any advice for prepping avocado for guacamole it would be to not pulverize the heck out of the avocado. It's much better if you mash it roughly with a large fork and leave chunks within than if you turn it into the texture of mashed potatoes. There really isn't any special magic involved in the making of this guacamole. It pretty much just tastes like any great guacamole with the addition of mango. If you've got a perfectly ripe mango that slices nicely and isn't overly squishy, then you'll end up with a good guac. 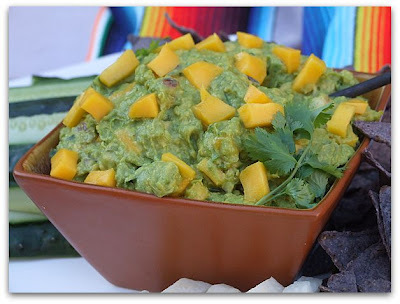 The mango contributes a sweetness to the classic guacamole just as mango salsa is a sweet change from classic salsa. Everyone enjoyed the change and it was devoured quickly with blue corn tortilla chips, sliced jicama and cucumber. Here was the rest of our menu for our Yucatan-themed dinner... all from Rick Bayless (and can be found on his site). And ALL were delicious. Everything was fabulous, but my faves were the authentic Tortilla Soup as well as the Mango Tart. Our dinners are this amazing every month. Don't you wish you were in our Gourmet group? And more importantly, were you raised to love avocados? I've placed the Mango Guacamole recipe HERE.